← Where’s My Liquid Paper? Hey, isn’t this funny? See, the groom doesn’t really want to go through with the wedding, so the bride has to drag him down the aisle! Um, but he apparently agreed to get married, right? All I can figure is that he knocked her up, and is starting to wonder if paying child support would really be that bad. Seriously, there’s just something that bugs me about this sort of humor, and the stereotypes it enforces. There’s a general idea in the public consciousness these days that the wedding is for the bride, and the groom basically only shows up because it would look silly if she were to say “I do” to nobody. It’s because it’s what little girls dream about for their entire lives, and they want to feel like princesses. Never mind that princesses usually marry for political reasons rather than love. What’s kind of both amusing and disturbing to me is that I looked up wedding traditions on Wikipedia, and the page on white weddings makes it sound like the whole tradition is just an exercise in pointless consumerism and showing off wealth. Like, the white dress is to symbolize that you’re willing to buy something that could be easily ruined and is only meant to be worn once (although apparently Queen Victoria, who popularized the white wedding dress, did wear hers again later). I know Wikipedia isn’t always an unbiased source, but it more or less symbolizes the worst of our culture. We can’t forget about how the diamond industry has gotten in on the whole wedding trend, supporting warlords and oppressing miners by selling shiny rocks at an enormous markup. 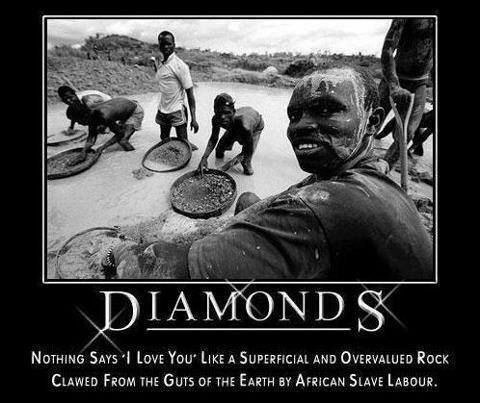 Even if it weren’t for the whole blood diamond issue, they’re always so tiny. Even the big ones are, and hardly anyone can afford those. I guess I was misled by all the enormous gems in the Oz books. Also, if only the bride is interested in the wedding, what does that say about the couple’s compatibility? Yes, a relationship sometimes means doing something the other person wants to do and you don’t, but shouldn’t a wedding be for both people? And if the bride wants to shill out craploads of money for the occasion, don’t forget that money is the main thing couples fight about. I’m not saying I’m some kind of marriage expert, just that I have to suspect a Bridezilla isn’t going to stop being a control freak after she gets married. This entry was posted in Capitalism, Economics, Gender, History, Humor, Relationships, Snobbery and tagged consumerism, diamonds, marriage, queen victoria, weddings, white weddding. Bookmark the permalink. This really bugs me too, as a woman and a feminist. I refer to the grooms at bride-centered weddings as “Ken dolls”- women are usually the ones complaining about objectification, but in this case the guy is being used as a prop. My fiance and I have agreed that our (hypothetical long-procrastinated) wedding is about an equal partnership, so we should have an equal say in it. I also work in a department store with a wedding registry, and I am always wondering if people are ever going to *use* all the china and crystal they buy there! We would rather ask folks to chip in to help us buy a house- but I’ve been told by relatives that this is “tacky”. And expecting people to fly to their “destination wedding” in the Bahamas isn’t? I think destination weddings are often just a way to observe the social nicety of inviting people you don’t really like without expecting them to show up. Anyway, when I got married, most of the people who attended the wedding just gave us money. Certainly more useful than china and crystal, which I’d be afraid I’d break if I used it.